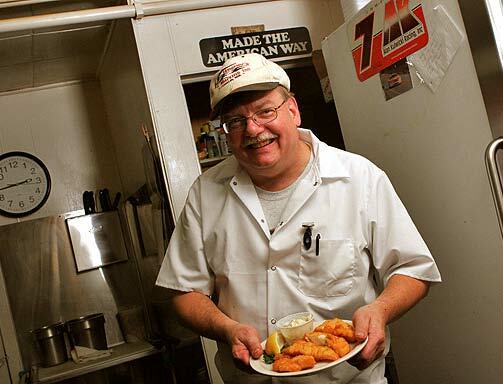 I was born and raised in Milwaukee, Wisconsin and started cooking in high school at Marc’s Big Boy. During my senior year, my counselor asked what I was going to do with my life, and my answer was I have no idea. Since I enjoyed cooking I decided to enroll in Culinary School at Milwaukee Area Technical College. At that time they were known as one of the best two year schools in the country. At MATC I studied under French Chef Robert Anglevin and German Chef Rudiger Grimm. To further excel my studies I decided to apprentice under Master Italian Chef John Marangelli for over two years. In fall of 1974, a new fresh seafood restaurant was opening up called The Anchorage. With my seafood background I was hired as Day Chef at the age of twenty. Bob Wolf was Executive Chef and my good friend Robert Siegel was Night Chef. After six months I was promoted to Interim Executive Chef. After thirteen months at The Anchorage I was contacted by Chef Knut Apitz to help open up The Grenadier’s in downtown Milwaukee. My duties were to make soups and sauces as well as working sauté. After a year at The Grenadier’s, in the fall of 1976, I was hired as Sous Chef at Mader’s German Restaurant. As Sous Chef I did most of the heavy food preparation. Soon I was promoted to Night Chef to run the very hectic dinner business, serving over 700 people on some Saturday nights. My last 5 years I was the Executive Head Chef. In total I spent almost 22 years working at Mader’s during which time I also did catering work with Larry's Brown Deer Market and Shelly's Catering. In the fall of 1997 I decided to go on my own and started Wegner’s Saint Martins Inn with my wife Kathie. Our goal is to be "casual" fine dining at its best. We have great food at fair prices. Our cuisine celebrates my expirence preparing Italian, seafood, steaks, and German entrees along with some modern twists on old favorites. Last year in 2015, I celebrated 45 years of cooking in the Restaurant Industry. Thank you all for being great customers throughout the years!